STORYTELLING is an art that people have practiced for eons, from text on clay tablets, to the first theater performances in Athens, to the campfires we share with friends and the ads we watch during the Super Bowl. It persists because telling a good story is how we celebrate life and connect more deeply with others. Storytelling is touted as a process in design circles too; one that emphasizes characterizing your target customer in such a way that you can create a plot and conflict to communicate a compelling story for your product. The creation of a story is often viewed as a mysterious process, originating from some deep well within us. But great stories don’t just happen. At Thinking Caps Design (TCd), they begin with an analytical process that assesses what is both familiar and unique about a project to identify how best to connect with customers emotionally. The clever and surprising details that emerge from this research often transform into design elements that stand out. A recent client wanted to refresh her identity as a portrait photographer. Her market is primarily professional women that need head shots for promotional purposes. In getting to know the client, we discovered her second passion was roses. An unfolding rose became central to a new logo design, with abstract petals forming the aperture of a camera lens. The color scheme and typeface were chosen to appeal to women, and the client can now speak passionately of her trained eye for natural beauty when securing new clients. 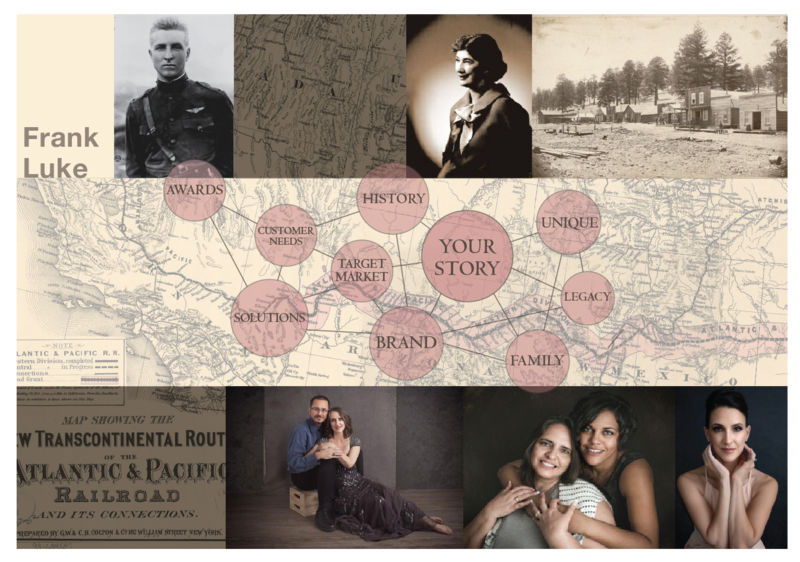 TCd was able to key off the appropriate story cues to create an emotional linkage via a new identity system. This type of meaningful connection is something that brands strive for every day. For some projects, the historical context is the best way to captivate audiences and build trust. TCd was invited to design interior signage for a new automotive showroom adorned with historic neon and vintage signs. We proposed putting the family’s long-established business and civic history on display along with interpretive signage. So when you buy a car from Bill Luke, you know this local business has served the valley over several generations. His trusted family lineage traces back to Second Lieutenant Frank Luke, a posthumous Medal of Honor recipient and the number two United States ace in World War I for whom our Luke Air Force base is named. Effective storytelling enables people to connect to the human side of the narrative which is closer to their heart. At TCd, storytelling exists in everything we do. 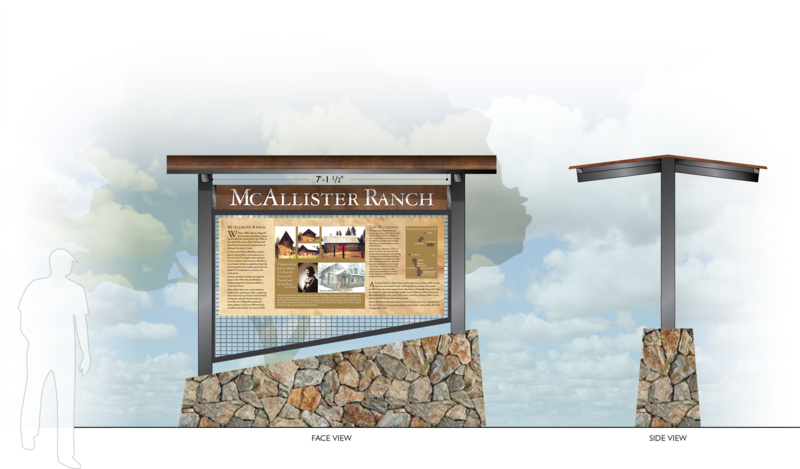 Sometimes it’s subtle and other times more distinct as in the case of a current project for the City of Flagstaff for McAllister Ranch. The city is erecting interpretive signage honoring the site of a prominent Flagstaff family’s home along historic Route 66. The storytelling in this instance was provided by the City, but TCd performs graphic interpretation in designing hierarchy, scale, color and contrast to the materials for the double-faced sign mounted on a masonry base of native Malpais stone overlay. Storytelling is wired into our human spirit. Following an analytical approach to storytelling helps TCd identify your target audience, locate the relevant content for messaging, ensure accuracy and provide the emotional appeal to connect with customers and make your message stand out.